Modern, minimalist and on-trend! Our Nessa Mini Med ID Cuff in Rose Tone is a Lauren’s Hope original, designed in our Kansas City studios. 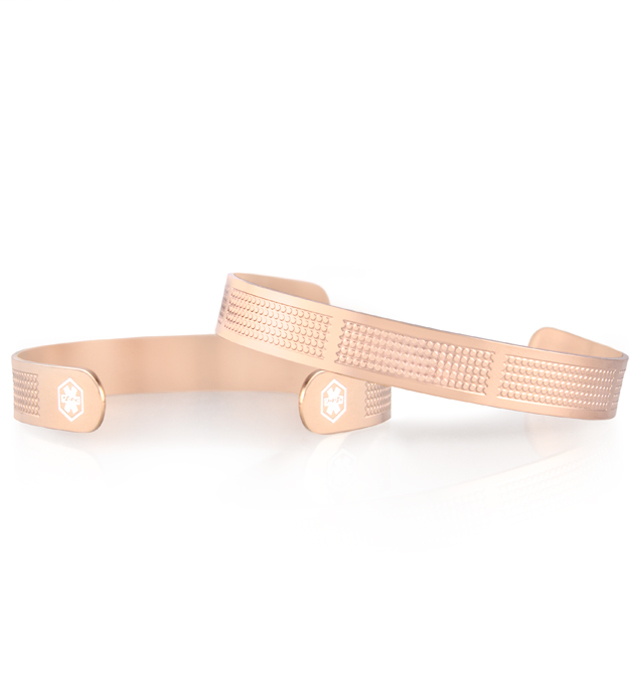 This hypoallergenic, stainless steel medical alert cuff features a rose gold tone finish with an embossed mini-coin pattern that makes for a durable, lasting bracelet with a delicate, feminine look. Both ends of your Nessa Med ID Cuff feature the universally recognized medical caduceus symbol, alerting first responders to your medical information, which we can engrave on the inside. Whether you or your loved ones wear a medical alert bracelet for weight loss surgery, lymphedema or post-mastectomy care, heart conditions, Parkinson’s, or any other medical condition or treatment consideration, medical ID cuff bracelets are a terrific option. Hypoallergenic and on-trend, these durable medical ID bracelets are easy to adjust and put on, making them ideal for people experiencing swelling of the extremities, weight fluctuations, or dexterity challenges.